This ticket is only valid from 2:00PM - 4:00PM for the meet & greet with Reniel Reyes, Danica O., or Aulie Secerio. You may arrive at the venue 30 minutes before the schedule meet & greet. A strict dress code policy is enforced. House Manila invites their guests to come by dressing smartly & appropriately. This ticket is only valid from 4:00PM - 6:00PM for the meet & greet with Karl Zarate, Beverly Cumla, Kristel Fulgar, or Mich Liggayu. You may arrive at the venue 30 minutes before the schedule meet & greet. A strict dress code policy is enforced. House Manila invites their guests to come by dressing smartly & appropriately. 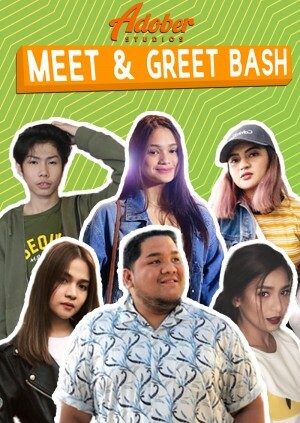 This ticket is only valid from 6:00PM - 8:00PM for the meet & greet with Lloyd Cadena, Rozel Basilio, or Chikkaness Ave. You may arrive at the venue 30 minutes before the schedule meet & greet. A strict dress code policy is enforced. House Manila invites their guests to come by dressing smartly & appropriately. This 2019, Adober Studios is kicking off the year with an intimate 'meet & greet' party where NO BASHERS ARE ALLOWED... only love and admiration amongst each other. It is a one-day event wherein Adobers Fans will have an opportunity to mingle and express their admiration to their idols. Plus, there are going to be fun games, performances, and various activities to make the event memorable. A strict dress code policy is enforced. House Manila invites their guests to come by dressing smartly & appropriately. House Manila reserves the right to refuse entry to those who don't follow the dress code.